United Yacht Sales New Jersey would love to guide you through a personal showing of this 45' Hatteras Convertible 1985. 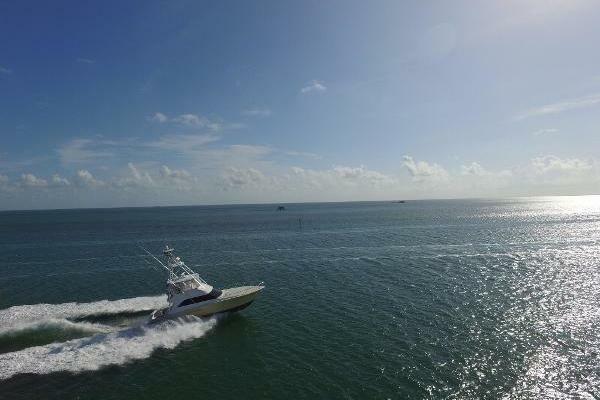 This yacht for sale is located in Fort Pierce, Florida and priced at $97,900. For a showing please contact us by filling out the form on this page and we will get back to you shortly! SALON:Spacious salon with L-Shaped lounge to starboard with storage under, also leather recliner, Hi-Lo Table with storage. Entertainment center, bottle/glass storage. Flat Screen TV with KVH Satellite. Custom wood blinds. GALLEY: Galley is down with microwave oven, large sink, abundant storage, indirect lighting, water and waste tank gauges. Full size refrigerator with upper freezer. MASTER STATEROOM:Master Stateroom is across from the galley with twin berths, hanging locker, ample drawer and storage under berths. HEAD:The Full head is to starboard with Vacu Flush head, sink, vanity, storage and separate shower stall. GUEST STATEROOM:The Guest Stateroom is forward in the bow with large V-Berth, hanging lockers. The original Hatteras Afromosa Teak Paneling throughout the cabin shows in excellent condition.